Canadian Mineral Processors, Mineral Processing | Flowsheets Metallurgical Consulting Inc. Approximately 600 delegates attended the 50th annual national meeting of the Canadian Mineral Processors at Ottawa, Ontario, this week. The conference was opened by Jonna Muinonen, president of the 2017-2018 session, and VP-Operations, Royal Nickel. The theme was “Past, Present and Future”, reflecting on the 50-year history of the conference. President and Consulting Engineer of Flowsheets Metallurgical Consulting Inc., Dr. Norman O. Lotter, presented a 50-year history of the development of Modern Process Mineralogy to the conference. 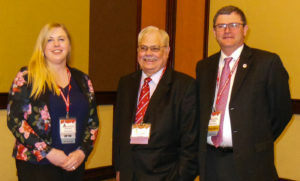 In the following photo, he is seen with co-chairs John Eggert, Eggert Engineering, and Alexa Cattani, Welco Expediting. The oganising committee and contributing authors are to be thanked for their contributions, this was a very good conference.